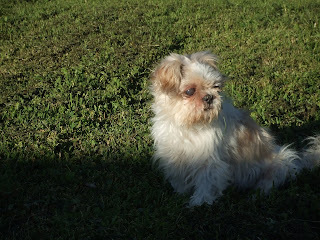 My Shih Tzu, Dandelion is 24 years into his zen journey and he reminds me daily of the beauty of small things and slow moments. So while this blog tells the story of a busy, fun and delicious weekend, all the images are just of Dandy and some of his happiest moments from a sunny June day. when T&T Heating and Air Conditioning appeared all bright and smiley faced on a Saturday afternoon when we are sure they had other plans! Hours later, after the frozen unit had thawed out, a new belt was installed and the wines all breathed a silky sigh of relief! Especially the 2003 Calzadilla - an amazing blend of Tempranillo, Cabernet, Grenache and Syrah from Castilla, Spain that we are pouring samples of for the next few days. Normally priced at $29.95, we hooked onto a deal with the importer and have this wine available for $19.95 (while it lasts!) Amazingly dark and beautifully complex, it's fabulous to taste a younger Tempranillo blend beside it and see the amazing difference aging can make on a well made wine. Don't miss out --- stop in at BELLA La Grande for a taste of the Calzadilla today! 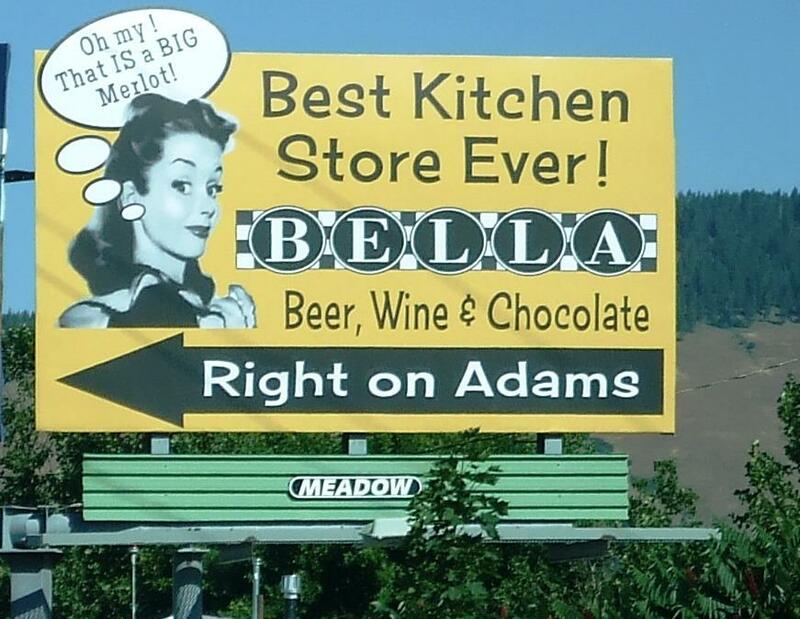 Sunday began with the installation of a new dishwasher at BELLA Main Street Market in Baker City. I got to visit with our Idaho friends/fans Dot and Jeff, celebrating their anniversary (Congrats again!) with Cafe Latte' at the BELLA slate coffee bar following a relaxing weekend in historic Baker City. We caught up about the new location in La Grande, shared stories and talked wine while Will did all the real work and wrenched out my beloved 1969 KitchenAid Dishwasher that finally gave up the ghost after years of completely reliable service. Bye Bye to the best dishwasher ever - it was salvaged from a home remodel 12 years ago and that's way more than you'd ever hope for from a FREE appliance! But with a good neighbor like SEARS just 2 doors down, we had options and great service and the barista crew only had to hand wash for one day! So with all appliances "GO", we decided to take a sidewalk table at Baker City Cafe and have a very Parisian moment on Main Street (grilled panini style grinders and fabulous spinach salads!) complete with great people watching! We met a couple from Norway on their touring bikes and headed towards Huntington, I had to admit a pang of jealousy there but decided to take a 'driving holiday' instead! There's still snow in one lane along the Anthony Lakes Highway - up on top- but the skies couldn't have been any bluer. The Tamaracks are the most vivid shade of bright green and even the old Crawfish Burn was beautiful as we passed by. We slowly drove along along through Tony Vey meadows, where the river meanders in fabulous curves through one of the most picturesque valleys in eastern Oregon, and then stopped to visit friends in Starkey. 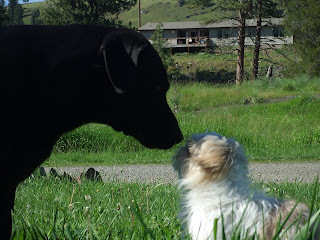 Dandy met Ticker, a sweet black lab and we all played in the grass for a bit. On our way back, we stopped at Bird Track Springs and walked the trail though the marsh and down to the Grande Ronde River. 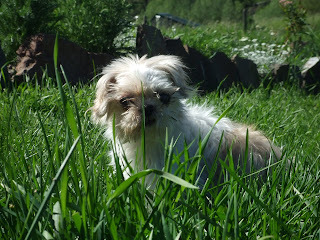 There were wild daisies blooming all along the trail and in a small opening in the flood plain near the river. I found a couple of totally groovy rocks along the river bank and dozens of Stone Fly "shells" all along the waters edge. Very cool! As we descended back into the valley, I started planning a dinner menu that would be the perfect meal to end such a gorgeous day and knew immediately that my favorite summer salad would be delish! I mix everything together in a large bowl and then cover and set aside for 15-20 minutes to let the flavors marry. Serve with steamed corn tortillas, extra salsa and a bottle of chilled Domaine Rouge-Bleu Rose' Cotes du Rhone. This wine has the most beautiful color - deep salmon - and has wonderful complexity and freshness with the blend of Grenache and Carignan. There's nothing 'pink' or frilly about this delicious Mediterranean Rose'! 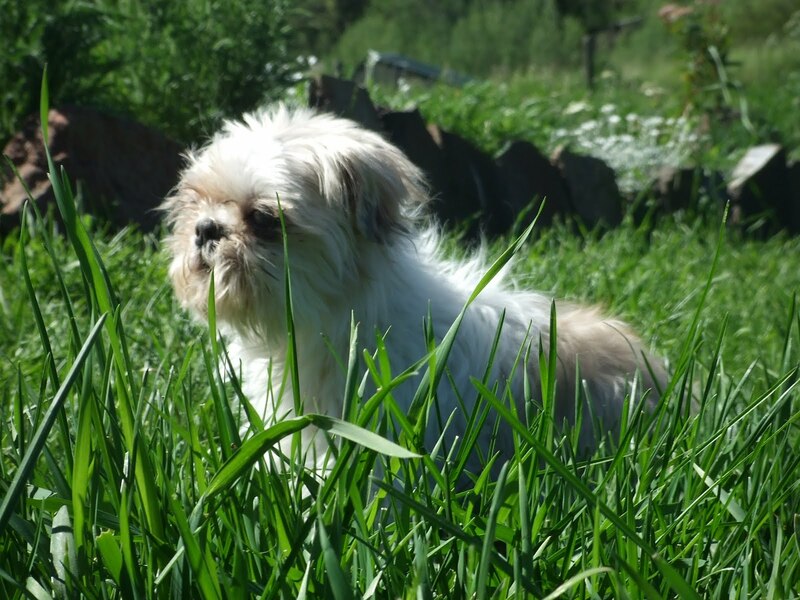 Set up a couple of lawn chairs on freshly mown grass, keep the camera handy to catch those cute pup pictures and enjoy a salad that captures all the brightness and liveliness of a beautiful day spent with friends and family! Sounds like a phenomenal (and even somewhat restful) weekend! And the Dandy Dog pictures are precious!